Nudie told the story that he gave this car to Roy Rogers, but Dewane Deck, the current owner, has a receipt and title indicating that Nudie sold the car to Rogers in 1984 for $4000. 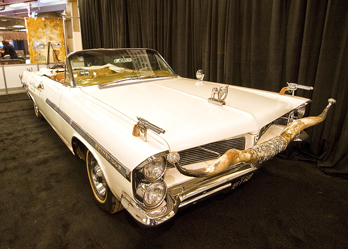 Visitors to the 2011 National Western Stock Show have a rare opportunity to see a customized “Nudie Mobile.” If you did not grow up in the 1950s or 60s or are a fan of Hollywood Westerns, then Nudie Cohen and Nudie Suits are probably not familiar to you. Nudie Cohn (1902-1984) was known for designing rhinestone-covered suits, known popularly as “Nudie Suits,” for some of the most famous celebrities of his era. He also became famous for his outrageous customized automobiles. Many of Nudie Cohn’s designs became signature looks for their owners. Among his most famous creations was Elvis Presley’s $10,000 gold lame suit. He designed the iconic costume worn by Robert Redford in the 1979 film “Electric Horseman.” Many of the film costumes worn by Roy Rogers and Dale Evans were Nudie designs. John Lennon was a customer, as were John Wayne, Gene Autry, Cher, Ronald Reagan, Elton John, Tony Curtis, Michael Landon, Glenn Campbell, Hank Williams, and numerous musical groups, notably Chicago and ZZ Top. Porter Wagoner said he had accumulated 52 Nudie Suits, costing between $11,000 and $18,000 each. Nudie himself strutted around Hollywood in his own outrageous suits and rhinestone-studded cowboy hats. His sartorial trademark was mismatched boots, which he wore, he said, to remember his humble beginnings in the 1930s when he could not afford a matching pair of shoes. His suits and shirts have become quite valuable to collectors. A Nudie stage shirt owned by Roy Rogers, decorated with blue tassels and red musical notes, sold for $16,250 at a Christie’s auction. Nudie was equally famous for his garishly-decorated automobiles. Between 1950 and 1975 he customized 18 vehicles, mostly white Pontiac Bonneville convertibles. They were nicknamed “Nudie Mobiles,” and the nine surviving cars have become valued collector’s items. The Nudie Mobile on display at the National Western Stock Show is a perfect and well preserved example of the customized cars that Nudie Cohn designed. It was owned by Roy Rogers. It is in perfect condition for a 1963 car and has 28,107 actual miles on the speedomoter. The car was first displayed at the Roy Rogers and Dale Evens Museum in Victorville, Calif., and, for the past 10 years, at the Roy Rogers museum in Branson, Miss. It was part of the very well publicized auction of Roy Rogers memorabilia. The car went to auction at Christie’s in New York where fans of Roy and Dale eagerly bought items from the life of the “King of the Cowboys” to the tune of $2.9 million dollars. The Roy Rogers Nudie Mobile that was expected to bring around $150,000, sold for $254,500 to a Denver businessman, Dewane Deck, owner of DenCol Supply Co. The Roy Rogers Nudie Mobile is definitely ‘one of a kind.’ It started life as a 1963 Pontiac Bonneville convertible. Nudie stripped out the interior of the car and refitted it with custom hand tooled leather flooring, seating, doors, dash, steering wheel and much more. He even replaced the seat belts with custom hand tooled cowboy belts. There are over 300 real silver dollars imbedded into the leather. There are 20 guns in and on the car. The guns are authentic, but were rendered non-firing when they were plated with silver. There are miniature pistols and silver horse heads that operate all the dash levers and gear shift and a derringer on the turn signal indicator. There is a small silver saddle in the center of the car that could function as an extra seat. On the front of the car is a huge set of longhorns trimmed in engraved silver. On the back of the car, Nudie added his favorite custom accessory, a signature, large deck and continental tire. And, just in case the car did not get enough attention, Nudie added an Ooooga Cow Horn and Cow Bell. If you miss seeing the Roy Rogers Nudie Mobile at the NWSS, Dewane Deck says that the car will probably be in the Greeley Stampede parade and perhaps at Cheyenne Frontier Days. If you would like to know more about Nudie Cohn, his official website is http://www.NudiesRodeoTailor.com.